The top of the image shows the crystal structure in the absence and presence of a bound chloride ion. Below is the proposed mechanism by which the anionophore works. In this case, chloride ions on one side of the cell membrane are exchanged for iodide ions as the anionophore shuttles anions across the cell membrane. Research by a team at the University of Bristol has taken the first steps towards new treatments for inherited diseases such as cystic fibrosis; one form of Bartter's syndrome (severe salt loss from the kidney); and two forms of myotonia (muscle stiffness), which are linked to defective movement of anions, such as chloride, across cell membranes. The research, published this week in Nature Chemistry, was led by Professor Tony Davis from the School of Chemistry, and Dr David Sheppard from the School of Physiology and Pharmacology, and was supported by a grant from the Engineering and Physical Sciences Research Council. Professor Davis said: "The common feature of all these disorders is that they are caused by the loss of chloride channels – gated pathways – which allow chloride ions to stream across cell membranes. "Drug-like molecules that transport cations across cell membranes have been known about for a long time. Some were discovered as antibiotics, while others are used routinely as tools for biomedical research. 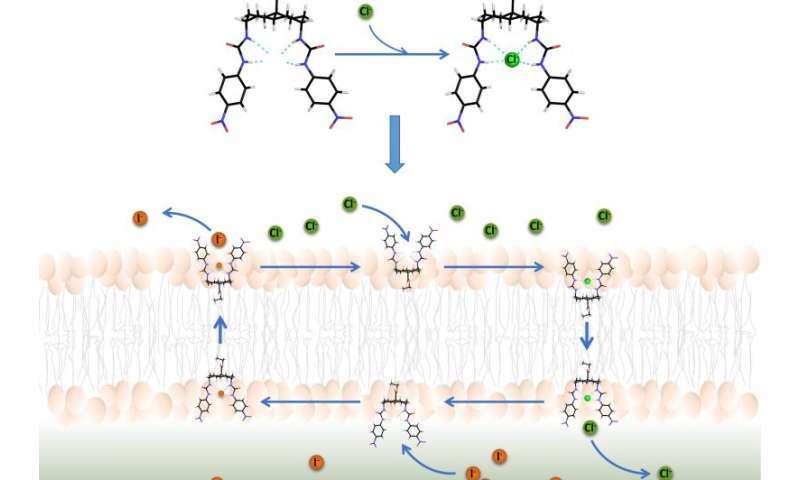 By contrast, drug-like molecules that transport anions across cell membranes are almost unknown in nature, and attempts to make them in the laboratory have previously met with limited success." To develop artificial anion transporters (termed anionophores), Professor Davis and his colleagues synthesized molecules with two distinct parts. One part is designed to bind lipids, the major component of cell membranes. The other is designed to form a cage-like structure to hold a chloride ion and protect it from lipids. These anionophores work by binding a chloride ion on one side of the cell membrane, shielding the ion from lipids as it is shuttled across the cell membrane, and then releasing it on the other side. Dr Sheppard said: "For many inherited diseases that affect anion transport across cell membranes, therapies that treat the root cause of disease are unavailable. For example, the majority of the 10,000 or so individuals living with cystic fibrosis in the UK today use treatments such as chest physiotherapy and antibiotics, which target disease symptoms not the underlying gene defect. For a small number of individuals living with cystic fibrosis, new therapies are now available that target their particular gene defect. If they can be developed into effective medicines, anionophores could be used to treat all individuals living with cystic fibrosis, irrespective of their particular gene defect." In previous work, Professor Davis's group had tested anionophores using artificial lipid membranes. In the present study, Dr Hongyu Li working with Dr Sheppard tested 15 anionophores on individual cells and epithelia – the sheets of cells that line ducts and tubes. By monitoring chloride transport in real time through changes in cell fluorescence or electrical activity, Dr Li identified one compound with special promise. This compound, a bis-(p-nitrophenyl)ureidodecalin derivative, has several important properties. First, it was deliverable to cell membranes. Second, it exhibited robust activity as an anion transporter approaching levels achieved by natural anion transport pathways. Third, its activity was long lasting, transporting chloride for about two hours following a ten-minute treatment period. Fourth, it showed no evidence of toxicity when tested on three different types of cells. Finally, the chemical properties of the bis-(p-nitrophenyl)ureidodecalin derivative approach those of drug-like chemicals.